I’ve spent more than 10 years as an online baseball writer with mild opinions. Now I’m about to have my first chance to act on those mild opinions, as I’ve been selected as a voter for the 2016 American League Rookie of the Year Award. If I had my druthers, I would’ve been selected as a voter for the 2015 American League Rookie of the Year Award, but I’ll take what I can get. Thinking about the awards feels different when you have an actual say, and so while I haven’t yet made up my mind, I figured it would make sense to put together a few FanGraphs posts so I can lay out how I’m thinking. I’m not going to tell you how I’m going to vote. Not only is that explicitly prohibited — I don’t even know which way I’m leaning. I’m hoping to make a decision this week. But the race probably isn’t that much of a mystery. NL Cy Young voters can’t talk about their first-place pick, but they’re free to acknowledge that Noah Syndergaard has a stronger case than Alfredo Simon. And with the AL rookies, Michael Fulmer was the presumptive favorite before Gary Sanchez went insane. Fulmer is going to finish somewhere around the top. So, let’s talk about him, shall we? It would be possible, and justifiable, to vote for Fulmer after thinking for about eight seconds. He leads all AL rookies in innings pitched. Nomar Mazara is the only AL rookie with at least 500 plate appearances, and only Cheslor Cuthbert and Max Kepler then come in north of 400 plate appearances. So Fulmer has been about a full-season rookie, and he has an ERA of 3.03. Sean Manaea is the closest rookie in innings, and his ERA is more than an entire run worse. Fulmer has pitched a lot, and he’s limited runs. What more could you want? It’s a simple case to make. Out of pitchers with 100+ innings. Exit velocity data comes from Baseball Savant. Fulmer ranks in the top 10 percent in adjusted ERA, and he also ranks in the top 10 percent in BABIP. Those obviously have a lot to do with one another. Fulmer has actually been less effective with runners on, so that part of his timing hasn’t been exceptional. But limiting hits is limiting hits, and limiting hits means limiting runs. By adjusted FIP, Fulmer drops out of the top 30 percent. By strikeouts and walks, he’s been more or less average. What should be done with the question about hits? What should be done with the 19-point difference between Fulmer’s ERA- and FIP-? Pulling from Baseball Savant, Fulmer’s been only slightly better than average in suppressing quality contact. He looks better by hard-hit rate, but pitchers with similar hard-hit rates have averaged identical ERAs and FIPs. Pitchers with similar soft-hit rates have averaged an ERA- four points better than their FIP-. Those pitchers have also averaged a .288 BABIP. So, there’s something there. And further to Fulmer’s credit, he’s yielded just three stolen bases. Teammate Anibal Sanchez has yielded 21. 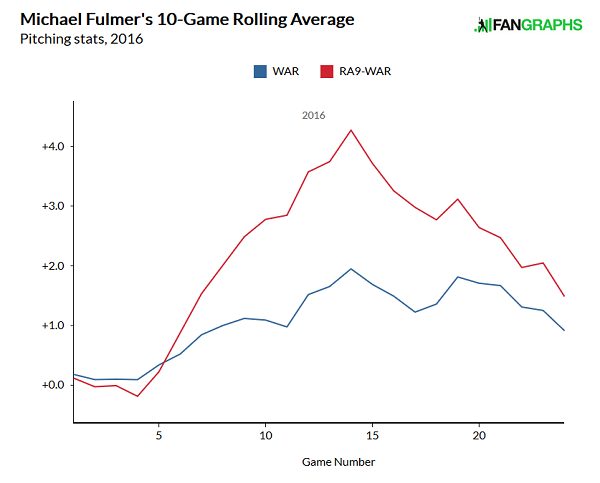 Fulmer isn’t easy to run against, so that should help him a bit. 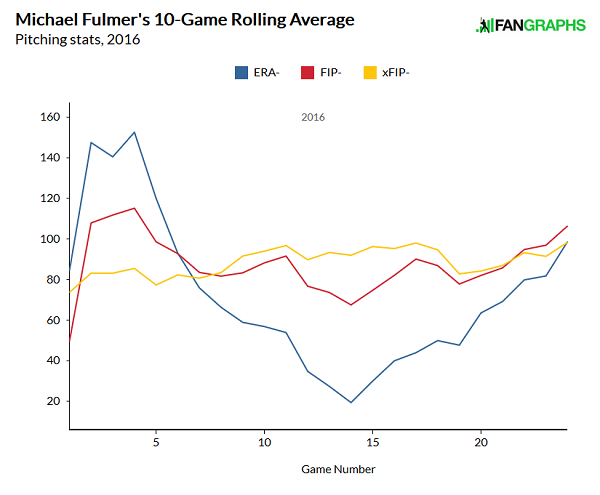 Where we are, though: It sure is tough to trust the legitimacy of Fulmer’s ERA-FIP gap. Certainly at least to this extent. I don’t think he’s demonstrated that he’s “earned” it. You might counter that Fulmer should get more credit, given the Tigers’ defense; they’re 28th in DRS, and 23rd in UZR. But it’s important to remember that defenses don’t play exactly the same every day behind every pitcher. Bad defenses can look good, and good defenses can look bad. As a comparison, think about lineups and run support. The Red Sox are the Red Sox, right? But Rick Porcello has a run-support average of 7.0 runs per nine. Eduardo Rodriguez has a run-support average of 3.0 runs per nine. Baseball’s weird. Just because the Tigers don’t have a good defense doesn’t mean they haven’t had a good defense behind Michael Fulmer. Fulmer and Sanchez might be more alike than you’d think. Fulmer has played an awful lot more, in the majors. Yet over 10 starts between May 21 and July 17, he allowed six earned runs in 65.1 innings. That’s good for an amazing 19 ERA-. Over Fulmer’s other 14 starts, he’s allowed 44 earned runs in 83.1 innings. That’s good for a pedestrian 111 ERA-. So Fulmer’s season has had an outstanding peak, and the rest of the time, he’s been a decent amount below average. Sanchez’s season has had an outstanding peak, and there just isn’t enough rest of the time. Viewed through this lens, how much credit should Fulmer get for his non-peak pitching, given that it hasn’t been particularly helpful? It’s a little like a potential Hall-of-Famer who stuck around post-peak to generate counting statistics. The counting stats can look great in the end, but if they’re topped off by not playing very well, well, that’s not what should get a player recognized. It seems like we should care most about when a player was good. When you glance at what Michael Fulmer has done, it’s obvious why he could be the Rookie of the Year. When you break it all down into more detail, though, the door opens up. Sure, Gary Sanchez would be a two-month candidate, but, what a two-month candidate. And Fulmer, in some sense, is kind of like a two-month candidate himself. And, heck, there have been some other real good rookies, too! Edwin Diaz! Tyler Naquin! Christopher Devenski! …more players! I’m thinking we’ll talk about Sanchez specifically tomorrow. And hopefully, by the end of the week, it’ll be clear to me how my voting ought to go. We hoped you liked reading Michael Fulmer as Rookie of the Year by Jeff Sullivan! Forget Obama. We need to check the first name on Gary Sanchez’s birth certificate. I’m positive he changed it from Pablo.